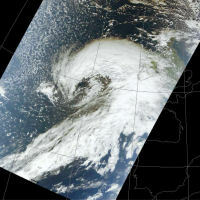 Satellite image of Cyclone Jeanette, 26/10/02 which produced a vigorous sting jet over the UK. Click on image for larger version. DIAMET is a NERC-funded consortium project involving the Universities of Manchester, Leeds, Reading and East Anglia under the auspices of the National Centre for Atmospheric Science (NCAS) and the National Centre for Earth Observation (NCEO), with the Met Office extensively involved as project partners. Its aim is to improve the forecasting of severe weather over the UK. The focus is on the understanding and prediction of mesoscale structures in synoptic-scale storms. Such structures include fronts, rain bands, secondary cyclones, sting jets etc, and are important because much of the extreme weather we experience (e.g. strong winds, heavy rain) comes from such regions. Weather forecasting models are able to capture some of this activity correctly, but there is much still to learn. By a combination of measurements and modelling, mainly using the Met Office Unified Model (UM), we will work to better understand how mesoscale processes in cyclones give rise to severe weather and how they can be better represented in models and better forecast. 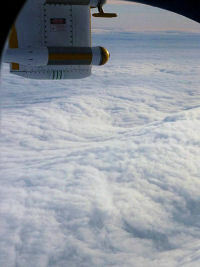 Pre-frontal gravity wave observed from the FAAM aircraft. The project is organised into three broad work packages. The first of these aims to look at real mesoscale structures in the atmosphere, using high-resolution in situ and radar measurements to derive their morphology and dynamics. The key to the latter is to calculate the production of potential vorticity by diabatic processes - especially phase changes of water (vapour/liquid/ice) and air-sea fluxes of sensible and latent heat. The associated high-resolution modelling programme will use the UM to simulate a representative number of events, diagnosing the PV tendency in the model and comparing with the measurements. Sensitivity studies and further diagnostics with the model will reveal the sensitivity of the forecasts to the correct representation of these processes and the dynamical consequences of diabatically-generated PV, both on the mesoscale and larger scales. Two student projects will investigate the role of boundary-layer processes in storm behaviour and conduct a statistical investigation of mesoscale precipitation features, based on archived radar and wind profiler data. Pilot flight of 3/11/09: path of FAAM aircraft overlaid on NIMROD rain radar image. The final WP addresses the problem of predictability, using a combination of ensemble and data assimilation techniques. A unique archive of forecast ensembles produced at the Met Office will be exploited to determine how well the forecast ensemble actually generates realistic mesoscale features, and the skill with which this is done (using standard measures of skill). Model errors in representing convection, air-sea fluxes and microphysics will be investigated to determine their impact on the forecasts for different flow conditions. The relationship between different model variables on the mesoscale is poorly known at present and this will be investigated using ensembles and the results of the measurement programme. Finally, novel approaches to data assimilation will be investigated through a student project. Characterising the generation of mesoscale potential vorticity anomalies in cyclonic storms, and their implication for the larger-scale development of the storm and for the effects (e.g. high winds, heavy rain). To characterize the generation of diabatically-generated PV associated with mesoscale structures within cyclonic storms, and to identify the related modelling sensitivities that may lead to errors in forecasts of such events. To use airborne, ground-based and remote-sensing measurements, along with numerical model analyses and forecasts, to describe mesoscale structures in frontal cyclones impacting the UK. To determine the effect of Boundary-layer processes on PV anomalies. To determine the statistical distribution of mesoscale precipitation anomalies over the UK based on long-term weather radar and wind profiler data. To determine the influence of specific PV anomalies on mesoscale development in cyclonic storms. To determine whether there are structural aspects of existing convective parameterisations which hamper our ability to produce accurate forecasts of mesoscale features in extratropical storms, and provide guidance for improved future parameterisations. To quantify the contribution of surface turbulent fluxes to storm development and their role in determining mesoscale PV structures. To measure microphysical properties and variability in mesoscale structures, use these to derive latent heating profiles and improve microphysical parameterisations. To quantify the predictability of mesoscale features and the relationship between predictability of detailed weather events (precipitation and high surface winds) and mesoscale features. To investigate and simulate sources of model error that most affect the forecast skill at convective scale. Determine sensitivity of forecast error to sampling error and compare with observations. To use ensembles of forecasts to assess the changing nature of multivariate relations at high-resolution and to understand their sensitivity to different sources of error (initial and boundary condition error, and model error). This will help to design a new formulation of forecast error statistics that will work with operational data assimilation (DA) systems, e.g. at the Met Office. To investigate next generation data-assimilation methods for the convective scale.